When measuring your existing collar …. 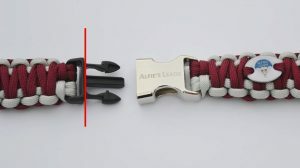 Measure the full collar, end to end but do not include the prongs on one side of the buckle, the part which recesses into the other half of the buckle. All buckles are different, this approach ensures a good fit.